But one group has thus far been conspicuously absent in the fight: Eisenhower’s own political party, the GOP. Indeed, Republicans’ silence on the matter of Eisenhower’s legacy says volumes about how far the party has come since his day. Rather than claim ownership over his legacy, they have abandoned it entirely, to the detriment of their party and their country. IMAGINE FOR A MOMENT that the planners behind the present Franklin Delano Roosevelt Memorial in Washington had hired an architect who proposed to represent FDR only as a toddler, rather than as a wheelchair-bound yet indomitable statesman. Liberal outrage would have rolled across the land like a mighty stream and forced an immediate redesign. Democrats would not have tolerated a literal and figurative belittling of Roosevelt, because Democrats of all stripes still pay homage to the founder and inspiration of the modern party that began with the New Deal. And yet the leaders of the Republican Party have not uttered a peep about the plan to permanently portray the five-star general and two-term U.S. president as an impoverished child. Clearly, Republicans feel no sense of loyalty toward Eisenhower. This should probably come as no surprise. The conservative movement that has taken over the GOP was nursed on hatred of Eisenhower’s moderation. 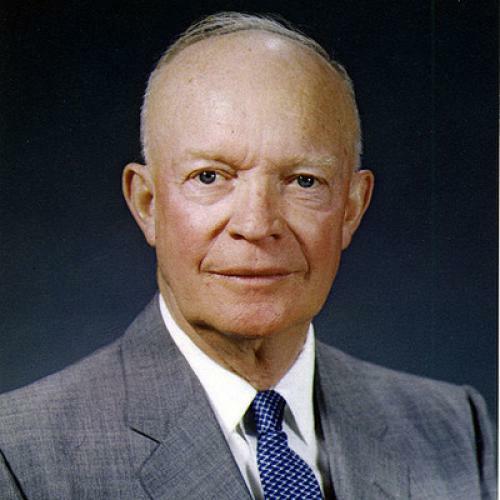 The eight years of peace and prosperity he gave Americans are remembered by conservatives as a dark age of “me-too” Republicanism, brightened only by the founding of the Ike-smiting National Review in 1955. The anti-heroic bent of the proposed Eisenhower memorial, with its refusal to acknowledge that there was anything great or admirable about its subject, may well be a source of considerable satisfaction to many on the right as well as the left. But it’s important to remember that the relationship between the 1950s conservative movement and its contemporaneous Republican President was one of mutual ill-will. Conservatives had expected that Eisenhower, as the first Republican president since 1932, would repeal the New Deal; instead he augmented and expanded programs like Social Security, thereby giving them bipartisan legitimacy as well as added effectiveness. Conservatives had expected that the president would support Senator Joseph McCarthy’s crusade to tar all liberals as pro-Communist; instead he denied McCarthy the authority to subpoena federal witnesses and receive classified documents, thereby precipitating the red-baiter’s overreach and fall. The conservative movement’s tablet-keepers have long memories, so it’s unsurprising that Ike has remained a devil figure for the right. What may seem more surprising is that at a moment when Republicans are posing as stalwart defenders of a balanced federal budget, they dismiss the example of the most fiscally conservative president of the past eighty years. Eisenhower balanced the budget three times in his eight years in office, a feat that neither Ronald Reagan nor George W. Bush came close to achieving. Ike cut federal civilian employment by 274,000 and reduced the ratio of the national debt to GNP, though not the absolute level of debt. The economy bloomed under his watch, with high growth, low inflation, and low unemployment. IN FAIRNESS TO today’s Republicans, Eisenhower’s values—prudence, pragmatism, reasonableness, frugality, and respect for the past—find little resonance on either side of our present partisan divide, or in American culture as a whole. Republicans may have abandoned Ike, but Frank Gehry, and the blingy, egotistical, celebrity-worshipping culture he represents, never could claim any attachment to him to begin with. Gehry’s aesthetic, which seeks freedom from the dead hand of tradition, is the very antithesis of the Eisenhower ethos. The Eisenhower memorial, if approved in its current form, would pay tribute to Gehry’s qualities rather than Ike’s, but it would be a sadly fitting monument to our present national mindset. The irony of the design controversy is that it’s unfolding at a moment when America, facing a future of painful austerity, would benefit from a recovery of Eisenhower’s virtues. But don’t expect them to be reflected in the Eisenhower memorial, or in our politics, anytime soon.